If you love someone’s photos and you don't want them to know that you are viewing their photos secretly. What do you do? Or let's say your friend has uploaded a full album of your recent picnic and you want to download all of them. The classic way of doing it is to download them one-by-one. However, that consumes a lot of time. So, the best way is to directly download them, but not individually. Step 1: Install Facebook DownAlbum from Google chrome extension. 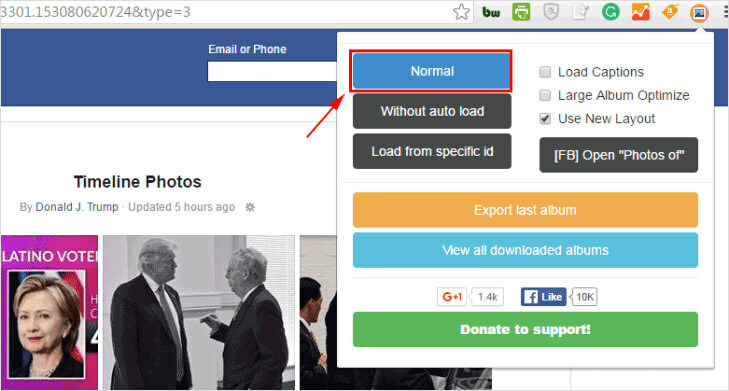 Step 2: Go to photo albums of the Facebook account or the Facebook page managed by others. Next, select any album you want to download and open it. (You have to be login mode when doing this). Step 3: Open “DownAlbum” while being still the Facebook album. Next, click Normal. Ensure that all photos from the selected album are loaded. To ensure all the photos are loaded properly, scroll down to the last photos. A window pop up will appear and click the OK and follow the download process. Save the images anywhere you want.